There are two of areas where computer games traditionally excel: racing fast machines and blowing stuff up. But somehow, combining the two into a compelling entertainment experience isn't always as easy as one plus one equals two. 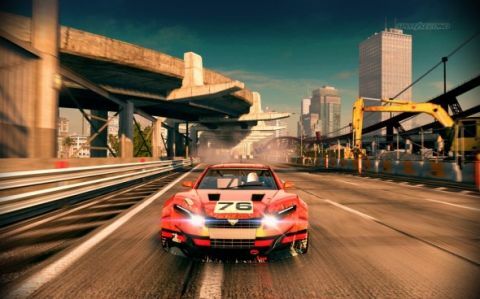 Thankfully Black Rock Studios have concocted a winning blend of speed and mayhem with Split/Second, perhaps the best 'combat' racing game to hit the PC since 1998's Dethkarz. Although the driving mechanics are pretty standard for an arcade racer – plug in a gamepad, bury the throttle, brake as little as possible, win – the satisfaction comes from employing 'Power Play' shockwaves to trigger violent roadside events that wipe out your rivals. These Power Play offensives range from massive truck bombs to scything cranes that can flick cars from the track like insects. Factor in the varied and richly detailed background scenery and the delicious destructibility of practically everything around you, and Split/Second elevates violence on track into a kinetic feast that pushes that “just one more race” yardstick to dramatic new levels. The kicker is that you and your competitors are part of a popular TV reality show where each successful event earns points to open up new televised episodes. The core Season mode features 11 multi-event episodes which, once completed, will unlock races and venues you can revisit in Quick Play mode. The variety of race modes ranges from conventional multi-lap chases to knockout events and survival contests where you try to avoid exploding barrels dropped from moving 18-wheelers and missiles fired from hovering gunships. An eight-player online and LAN mode and a two-player splitscreen mode give us plenty of options. The game's simplified HUD display – there are no distracting speedometers or damage meters – features a three-segment Power Bar that you can replenish with driving manoeuvres such as drafting or catching air. A Level One Power Play will trigger impressive carnage, but a cataclysmic Level Two shockwave – available once you've filled all three Power Bar segments – can bring down entire buildings and collapse Golden Gate-sized bridges. This introduces another terrific feature called Route Changer, where you can create shortcuts or entirely new track layouts by demolishing conveniently placed structures. Finishing well unlocks progressively faster and stronger cars (nothing licensed, no manufacturer wants to see their products pancaked into scrap metal every 30 seconds) but, true to Split/Second's action and arcade roots, your race doesn't end when you crash or end up under tons of rubble from a caved-in flyover. You simply reset further back in the field and try to make up for lost time. Split/Second's consistently addictive action would have earned it a higher score but for some annoying stability issues. I encountered regular crashes to the desktop while running it on a 64-bit Windows 7 system and persistent graphic stutters under Windows XP. What's more, the game's lap counter would bizarrely mess up at critical stages by extending a two-lap race into infinity, forcing me to abort and replay the event, while arbitrarily cutting other races in half. It even credited me with a win a few yards past the start line once. These patchable annoyances hurt the continuity, but patient types will likely forgive them just to get to the good explodey stuff. And with so many cars, buildings, and structures to race through and obliterate, Split/ Second delivers a ton of rewarding arcade racing.